Home » MMPK Makgeolli Week!!! What is MMPK Makgeolli Week? You’ve heard of Restaurant Week, you’ve heard of Food Week, well now Makgeolli Mamas & Papas Korea proudly presents the very first MMPK Makgeolli Week! Over the course of our 2 years in operation, MMPK has had the opportunity to explore, taste and discover so many fantastic makgeolli bars. We feel passionately about spreading the word about not only where to try, but also what is best on the menu at the bars we review. We know it’s not always easy to know where to go, what to order, or most importantly which makgeolli you might like. And so the concept of MMPK Makgeolli Week was born! We got together with 2 of the best makgeolli operations in Seoul to team up in a 10 day long event, showcasing their very best makgeolli and food. Both Muldwinda and the recently opened Neurin Maeul Brewery & Pub, are experts in the makgeolli industry and have each designed a special MMPK Makgeolli Week menu. You will have the opportunity to experience the best of what these bars have to offer, as well as broadening your own makgeolli horizons. So how does MMPK Makgeolli Week work? Both bars have designed their own set menus for MMPK Makgeolli Week, which anyone will be able to order for the duration of November 7th – 17th. 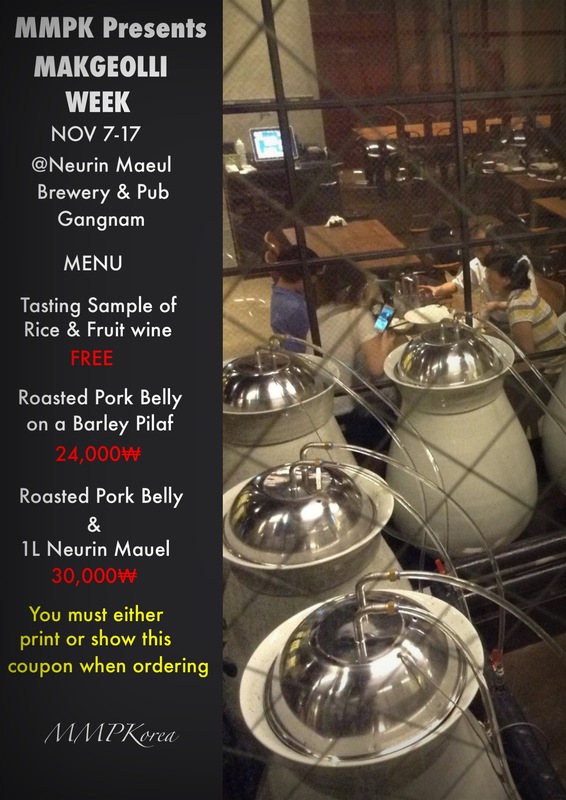 If you choose to go to the Neurin Mauel Brewery & Pub, you must download the menu coupon below to show when ordering. For more information and directions check outNeurin Mauel Brewery & Pub’s MMPK Info Page here. 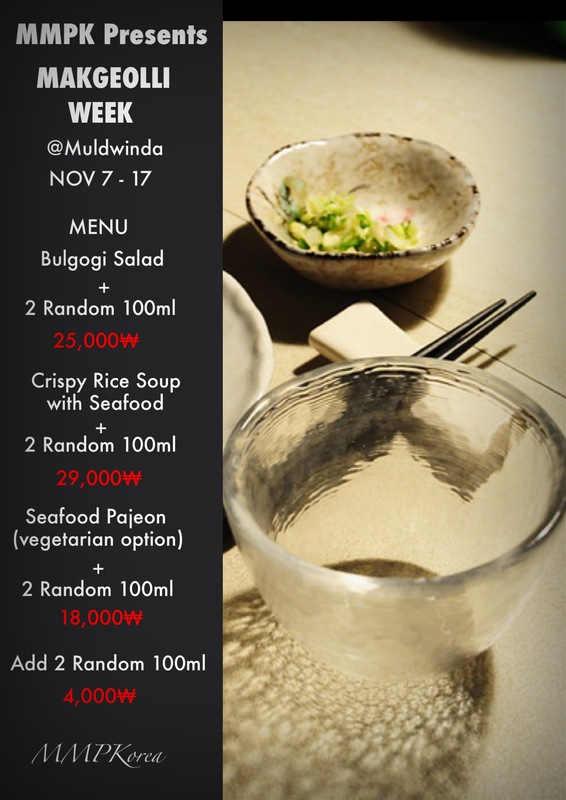 If you want to visit Muldwinda, you don’t need to show anything, simply go to Muldwinda and you will be able to order off the MMPK Makgeolli Week Menu. For more information and directions, check out Muldwinda’s MMPK Info Page here.